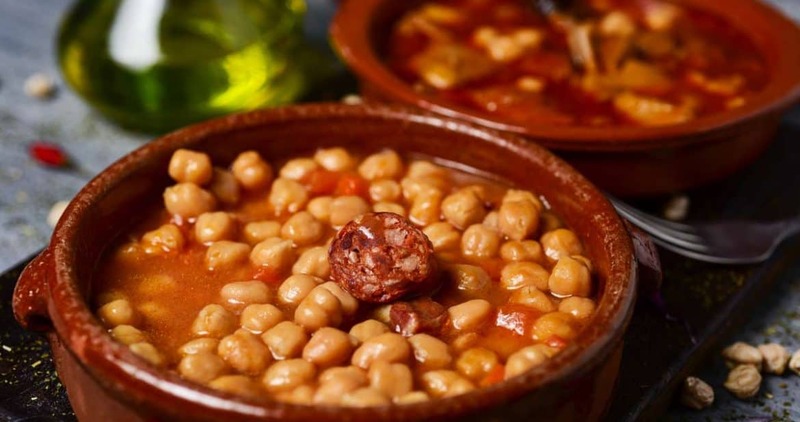 Who doesn´t like to enjoy a delightful chickpea stew like the one we make in Cuba? This recipe is a delicacy and is part of our gastronomy; furthermore, it is very easy to make. Chickpeas are a great source of vegetable protein, one of the most important staple nutrients we can include in our diet. They are a great source of fiber and vitamins such as B1, B2 and B9 from the vitamin B complex, as well as vitamins C, E and K.
Furthermore, they contain essential minerals such as calcium, iron, magnesium, potassium, zinc and phosphorus. This stew was inherited from Iberian cooking, which became part of our culture with the arrival of the Spanish. As time passed, different versions of the recipe were adopted, depending on the ingredients we had on hand. 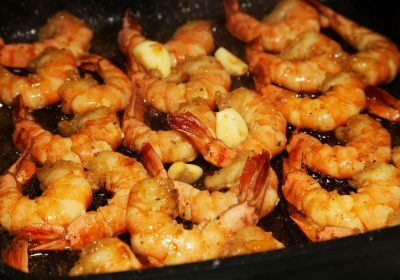 The preparation techniques and the secret of this delightful dish, also depend on the family tradition of each home on the Island. 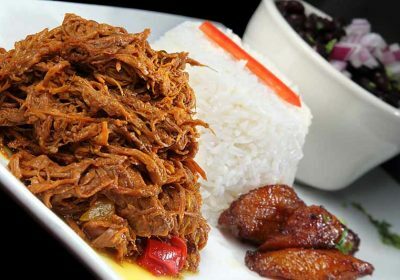 However, today we will explain the step-by-step instructions of this authentic, traditional Cuban recipe, from which you can make all the variations you would like. We assure you it is absolutely delicious. You cannot miss the experience of preparing the best chickpea stew with your own hands and in the comfort of your home. It is perfect in any season of the year. You can have it with white rice, salads, or fried plantain. 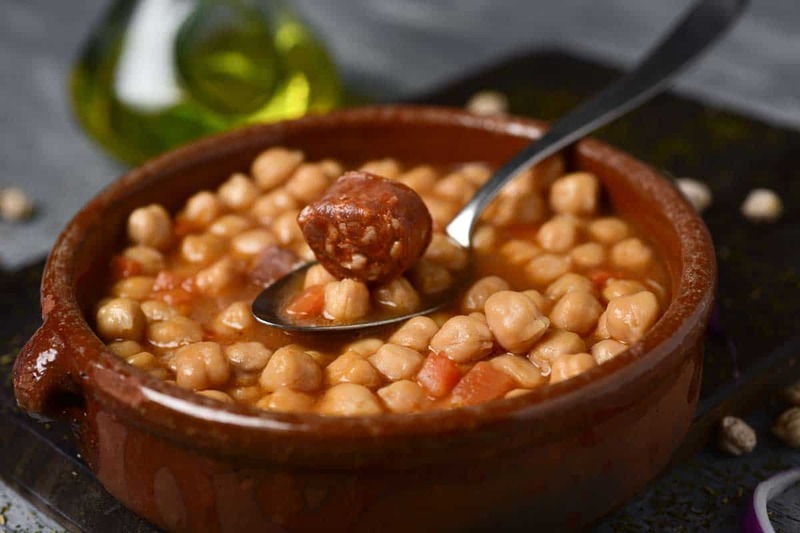 1 How to make Cuban-style chickpea stew? How to make Cuban-style chickpea stew? Before we explain which ingredients to use and the cooking process, we want to give you a trick we are sure you will find useful. To considerably reduce the cooking time of this chickpea stew, we recommend you put the chickpeas in water the night before. For this, use enough water so you cover them completely and add a teaspoon of salt. The most delicious Cuban-style chickpea stew, one of our favorite recipes made with legumes, is very easy to make and has an exceptional flavor. First, we soak the chickpeas with water and add some salt; we let them marinate for 12 hours before we cook them. After this time, we drain them and put them aside. Then, we get the rest of the ingredients ready: we cut the bacon, the chorizo, the blood sausage, and the potatoes in medium-sized pieces; we finely slice the onion and we crush the garlic cloves. When we have everything ready, we heat up the oil in a pot and we add the onion and the garlic, along with the paprika, the pieces of potato, blood sausage, chorizo and bacon; all this in order to make a sauté. We add the tomato purée and we mix everything together, then we add water and lastly add the chickpeas with pepper as desired. We check the amount of salt and if we find it necessary, add a pinch more. We cover the pot and let it cook for 30 to 45 minutes on slow heat until the chickpeas get tender. We take the pot off of the stove and we serve it hot. In some cases, you can add some pieces of squash to the stew. You can do it if you like, the result will be equally great and delicious.